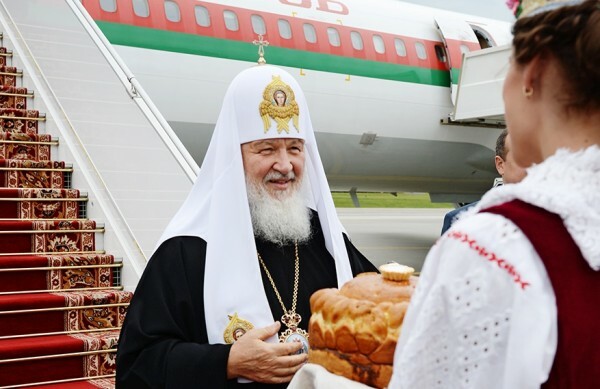 On 20 June 2015, His Holiness Patriarch Kirill of Moscow and All Russia arrived in Minsk with his primatial visit to the Byelorussian Orthodox Church. The official delegation that accompanies His Holiness consists of Metropolitan Hilarion, chairman of the Moscow Patriarchate’s Department for External Church Relations (DECR), Bishop Sergy of Solnechnogorsk, head of the Moscow Patriarchate’s Administrative Secretariat, archpriest Nikolai Balashov, DECR vice-chairman; archpriest Andrei Milkin, head of the Patriarchal Protocol Service; and deacon Alexander Volkov, head of the Patriarchal Press Service. His Holiness and his suite were met at Minsk-2 airport by Metropolitan Pavel of Minsk and Zaslavl, Patriarchal Exarch of All Belarus; Byelorussian Deputy Prime Minister Ms. Kochanova; Commissioner for Religious and Ethnic Affairs of Belarus Mr. Gulyako; head of the State Protocol Service of the Byelorussian Ministry of Foreign Affairs Mr. Sluka; H.E. Alexander Surikov, Ambassador Extraordinary and Plenipotentiary of the Russian Federation to the Republic of Belarus; bishops and clergymen of the Byelorussian Exarchate. The meeting of His Holiness with his Byelorussian flock is timed to three remarkable dates, namely, the 1000th anniversary of the demise of St. Vladimir Equal-to-the-Apostles; commemoration day of the Synaxis of the Byelorussian Saints; and the 70th anniversary of the Victory in the Great Patriotic War.